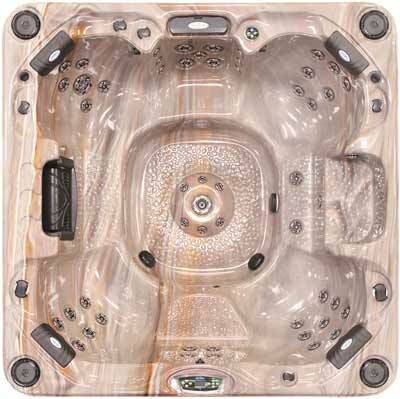 Your dream hot tub becomes a reality with the Escape E864B. 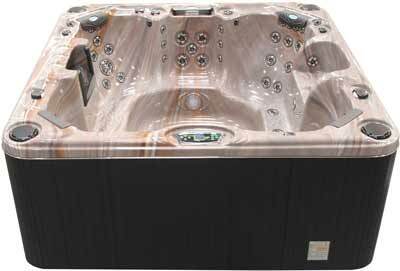 This spacious 8-foot spa combines the best in hydrotherapy, luxury amenities and powerful water clarity features all in one hot tub. Sit back and relax as 64 powerful spa jets melt the stresses of the day away. Each seat is dressed in a unique jet configuration that massages specific back muscles. The included neck blaster system targets the neglected neck area and unblocks tension. Rest your tired head on any of the included pillow headrests while you listen to the calming sounds of the included waterfall. Best of all, keeping your water clean is simple with the included Ozonator that helps purify your water with natural ozone. Get ready for a soothing silky smooth experience and bring home the Escape E864B today!